Mapping the existing ecosystem: when a new technology emerges, a radically different approach to network design is needed. To understand a sector fully – and hence how the value chain should be configured – you need to map not just the companies involved but all the external stakeholders who have a strong interest in, and influence on, reconfiguration. These could be investors, governmental institutions, research agencies or universities. Our mapping tools have been designed to capture the complexity inherent in this scenario. 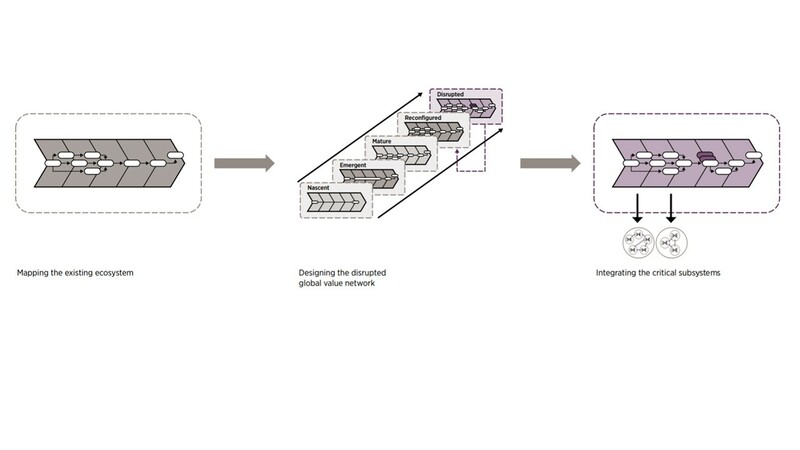 Designing the disrupted global value network: our approach to global value network design reflects the typical stages in network development and the trends that drive redesign. This involves tracing the evolution of the network from the point when a technology first appears and the value network is highly disorganised (nascent), through a process of experimentation (emergent) and stabilisation (mature) to the point when the network becomes suboptimal and needs to be reconfigured. This is likely to be followed by the emergence of a new disruptive technology or business model, and the cycle of reconfiguration and disruption starts again. Our design tool allows us to develop different scenarios and understand how to configure the global value network to respond to disruption. Integrating the critical subsystems: a further challenge is that global value network performance is often hindered when semi-independent subsystems become disconnected, often as a consequence of disruption-driven reconfiguration. Our approach helps to reveal the critical subsystems and define their intrinsic characteristics, and drives systematic reintegration that ensures enhanced performance for all players in the value network. This study was commissioned to help vehicle manufacturers in the North West of England, and their tier 1 suppliers, address some of the challenges facing the automotive sector in general, and this region in particular. Mapping the ecosystem led to a clear understanding of the strengths and weaknesses of the sector’s supply chain. The findings were used to inform a supply chain improvement process, which included: targeting market segments with the highest growth potential; establishing a supply chain capability development programme; and looking at more efficient use of resources to support longterm sustainability. More information. IfM is playing a pivotal role in a major project looking at how to reconfigure the UK’s pharmaceutical supply chains in order to capitalise on technology advances in both medicines and patient-centric delivery models. The £23m project is jointly funded by the UK government and leading pharmaceutical companies. "This funding brings together 20 partners from across industry and academia in an innovative partnership with the aim of transforming how medicines are made and ensuring we are even more responsive to the changing needs of patients. This bid, which will focus on areas such as continuous manufacturing and new technology platforms, creates and safeguards jobs across the partnership and helps keep the UK at the forefront of life sciences." We have used our approaches to configuring global value networks with a wide range of industry sectors where disruptions to a product or process technology – or to supply and business models – are leading to radically different value networks. Designing new supply models that will deliver more personalised customer service, safeguard jobs and achieve significant projected savings by: increasing the level of right-first-time manufacturing and reducing inventory held and days of supply, cycle times and the cost to market of new product development. Establishing sector-wide capability development programmes to address issues such as: the need for better business processes within tier 1 and 2 suppliers; skills deficits; lack of regional innovation strategies. Exploring trends, scenarios and possible intervention strategies to help firms achieve ‘first-mover’ advantage at the very early, chaotic stages of an emerging industry and identify potential opportunities and barriers to serving new or previously elusive markets.